Asus India has unveiled FonePad tablet with 7-inch screen in the country. The device is priced at Rs 15,999 and will be available at Croma stores and Asus retail showrooms across the country. The manufacturer also sells Google Nexus 7 tablet in India, starting at Rs 18,999. 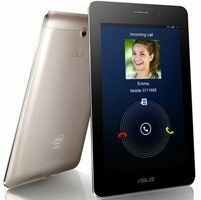 Announced in February 2013 at Mobile World Congress, Asus FonePad also offers voice calling functionality. It has display resolution of 1280x800p and 216ppi pixel density and features an IPS panel. The device is powered by a 1.2GHz Intel Atom processor coupled with 1GB RAM and comes with 8GB onboard storage, with microSD support up to 32GB. For connectivity, the tablet offers features like 2G, 3G, Wi-Fi, Bluetooth 3.0 and microUSB 2.0. A 3.15MP camera is strapped to the back of Asus FonePad, whereas a 1.2MP unit is placed in front. Running on Android 4.1 (Jelly Bean), this tablet has a 4,270mAh battery that offers talk time of 9 hours. This device has aluminium back, weighs 340gram and measures 10.4mm along the waist. This tablet competes with the likes of Samsung Galaxy Tab 2 (3G variant) and Google Nexus 7 (base variant) at this price point. However, both these device feature multi-core processors, as compared to the single-core CPU used in FonePad.